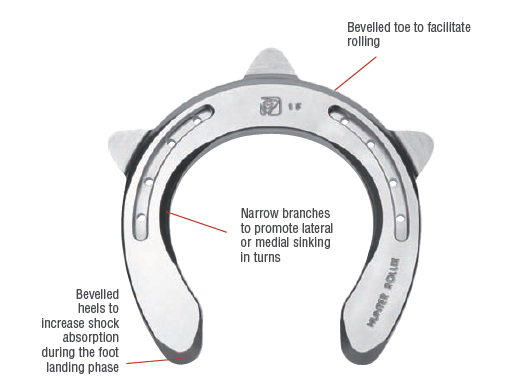 An Aluminum sport horseshoe especially designed for those who like steel shoes! Shoe with Parabolic coverage: wide coverage on the toe - narrow on the branches - wide on the heels. Designed with high-tech aluminum alloy. Non- tempered alloy: hot work possible up to 450C. Narrow branches to promote lateral or medial sinking in turns on penetrable and compacted ground. Preventive sport shoe made to optimize comfort and performance whilst reducing stress, thanks to its light weight design. Click the button below to add the HUNTER ROLLIX to your wish list.